The risk of postoperative delirium in older patients undergoing hip fracture repair is not reduced significantly with lighter sedation levels, according to a new study published in the journal JAMA Surgery. Frederick Sieber, professor of anesthesiology and critical care medicine at the Johns Hopkins University School of Medicine, and colleagues conducted the study to determine whether limiting sedation levels during spinal anesthesia reduces incident delirium overall. “Contrary to what we expected, sedation levels do not appear to affect postoperative delirium for sicker patients,” says Dr. Sieber. Postoperative delirium — marked usually by reversible memory disturbances, confusion, and hallucinations — has long been observed as a too-frequent outcome of surgery in older patients. Levels of anesthesia, Sieber says, have been seen as one potentially modifiable risk factor in efforts to prevent the condition, or reduce its duration and impact. This double-blind randomized clinical trial (A Strategy to Reduce the Incidence of Postoperative Delirium in Elderly Patients [STRIDE]) was conducted from November 18, 2011, to May 19, 2016, at a single academic medical center and included a consecutive sample of older patients (≥65 years) who were undergoing nonelective hip fracture repair with spinal anesthesia and propofol sedation. 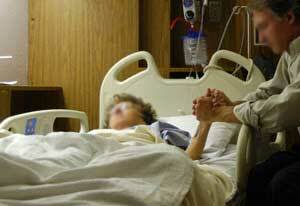 Patients were excluded for preoperative delirium or severe dementia. The study involved 200 participants, the mean (SD) age was 82 (8) years, 146 (73%) were women, 194 (97%) were white, and the mean (SD) CCI was 1.5 (1.8). One hundred participants each were randomized to receive lighter sedation levels or heavier sedation levels. A good separation of intraoperative sedation levels was confirmed by multiple indices. Each comorbidity is assigned a weight based on the statistical risk of death over a decade; the higher a person’s total score, the greater the risk of death. A score of zero does not mean that someone is completely healthy, but that they do not have any of the 17 severe, predefined comorbidities used for CCI score calculation. For those in relatively better health, deep sedation more than doubled the risk of postoperative delirium compared with those having light sedation. 39 per cent of patients who received deep sedation had a postoperative delirium diagnosis one to five days after surgery, while the incidence of delirium was 34 per cent in the light sedation group, a difference considered statistically insignificant. Patients who had a baseline CCI Charlson comorbidity index) score of zero were 2.3 times more likely to experience postoperative delirium if they received deeper sedation. A history of vascular comorbidities, particularly those included in the CCI such as strokes, severe diabetes, and heart attacks were most associated with postoperative delirium. Sieber says of the many complications that can result from this operation, delirium is the most common, affecting an average 35 percent of all patients. Sieber says it is unclear why less sedation failed to reduce the risk of delirium in the sickest patients, as this was not what we expected. However, it is possible that they did not account for other factor(s) associated with delirium in the subgroup of sickest patients that may have masked the benefits of lighter sedation. He says more research must be done to confirm his team’s findings, but moving forward with the new information in hand, he believes caregivers must focus on helping certain subsets of patients with vascular disease particularly get as healthy as possible before an operation. “In the primary analysis, limiting the level of sedation provided no significant benefit in reducing incident delirium. However, in a prespecified subgroup analysis, lighter sedation levels benefitted reducing postoperative delirium for persons with a CCI of 0,” concluded the authors.